The blurb really grabbed my attention and I couldn't wait to read this book. This book just missed the mark for me. There was so much description about the earthquake and the aftermath that I felt like Chance and Kit were just thrown in as an afterthought. There were sooo many pages with no dialogue that I was getting bored. I really liked the parts where Chance and Kit interacted, but those times were lost in all the earthquake info. Then in the last chapter, everything happened and then the book was over. It was like the author was rushed to hurry up and get the book done. I am sure others will enjoy this book but it was just a miss for me. First things first... the narrator's name is Chance Crawford. (raises eyebrow) Any Gossip Girl fans? Who else envisioned Nate Archibald (Chace Crawford) while reading this novella? Now that my snark has passed, let's move on to the review itself, shall we? This is an instance of a novella perfectly crafted, the content written in a way where the reader doesn't feel as if anything was left out, or that the pacing was too quick, or that it was just a fluff piece to pass the time. On Solid Ground was a complete story, spanning twenty-four hours, that somehow managed to remove insta-lust/love and replace it with realistic slow-burn romance. With that being said, this novella isn't for everybody. There're no bells and whistles, no nonstop, gratuitous between-the-sheets action. The heart-pounding moments are due to realistic situations, not over-the-top angst or suspense. The plot is hyper-focused on a singular event affecting the two men as they struggle to survive. Nate and Kit... (cough cough) excuse me, I mean Chance and Kit, they work together in the same building. Both working their way from lower level jobs within their professions, an IT geek and a business suit, yet there is a clear divide in their matter of importance. They're friendly, giving a wave and a hello, but nothing has passed since a pleasant, chemistry filled office party months ago. The unthinkable happens – an earthquake shakes their lives to the very core, followed by the destructive nature of aftershocks. The pair of men struggle to survive, while their narrative showcases a viewpoint readers generally never hear. Usually a book takes place in the aftermath, or we see it on the news during and after the event, but it's always the view of those looking from the outside in. This is shown in the now, happening on the inside, while they look out waiting for help to arrive. Chance and Kit voice the panic, the fear, the stark terror, and the hope of waiting for rescue that may never arrive in time, while also battling the bittersweet of what might/should have been, if only they'd acted on the crushes they've felt for many months. With so few pages, and even fewer hours it encompasses, the threat of this being the end accelerates their emotions, but not in an unrealistic or insta-love fashion. The chemistry and connection was felt by this reader. There are brief moments of levity that lessen the stress, which was most appreciated when it came to pacing, and these moments fed into the realism of the slow-burn romance. Enjoyed or entertained wouldn't be the words I'd use, which is why I'm not sure this novella is for everyone, especially those who wish a surface level feel-good read about romance and heat. As a word-weaver, I don't know which word to use, but I am glad I read the novella and do recommend for serious, realistic readers, looking for new take on romance. This is a really clever story, which definitely had me on the edge of my seat, and most definitely cheering on their opportunity to finally come clean about how they feel about each other. The earthquake elements were very vividly written, and between Die Hard, and every earthquake movie ever written, I was right there with collapsing walls, glass all over the floor, and lack of comms. The two men are both selfless by nature, but as they find themselves alone, the barriers break down, and they reveal much about themselves. They continue to show great restraint and care for each other, which comes over so well. I loved the changes in pace as they rush to try and get everyone out, then have to sit and wait for rescue, then recognise that maybe there will be no rescue. At no time is there any self-pity, no, they are too happy to have finally accepted that they have the desire to explore further the feelings they have for each other. That all this comes out in just over a hundred pages, and 24 hours, is an indication of excellent writing, so thank you very much Ms. Anderson. A single life-altering earthquake traps Kit and Chance alone together in an unstable office building. In a matter of minutes, the two strangers are forced into an intimacy only forged in a life or death situation. I loved everything about this story. The novella format perfectly captures the abrupt intensity of Kit and Chance’s experiences over a few short days. There is very little build up to the earthquake. At the start, both men are likeable strangers to each other – and to the readers. Their characters are revealed first through their instinctive responses to the disaster and later as their situation becomes more perilous. Faced with their own mortality, Chance and Kit’s reflections feel natural. They question relationships and life choices with raw honesty. I loved the ideas thrown up in conversation. I love the relationship that develops between Kit and Chance in such a pressurised environment. As always, Quinn Anderson’s strength is her brilliant dialogue and she manages to keep this story feeling real but not too heavy or maudlin. This is very different than anything else I’ve read from this author and the carefully, deliberately crafted writing is wonderful. I was completely immersed in Kit and Chance’s experience and they both instantly became very real to me. This was a completely unexpected treat and I can’t recommend it highly enough. 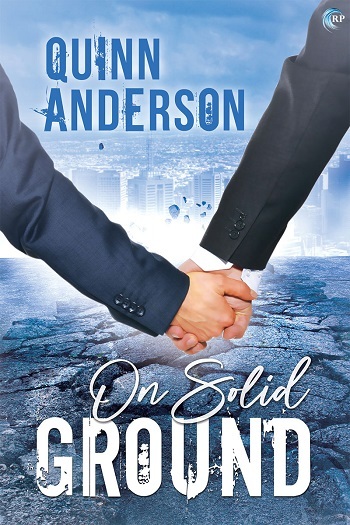 Reviewers on the Wicked Reads Review Team were provided a free copy of On Solid Ground by Quinn Anderson to read and review.